Defensive Player of the Year, Rio Grande City's Rodrigo Nuñez, poses at Edinburg Vela High School on Thursday, March 22, 2018, in Edinburg. 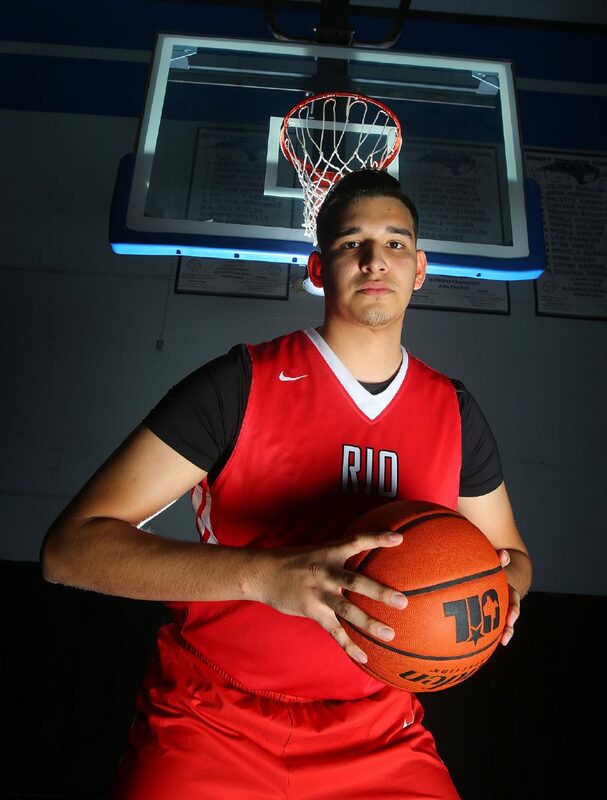 EDINBURG — Rio Grande City senior Rodrigo Nunez had to wait a long time to finally make the playoffs. He played on the varsity team as a freshman, and for his first three years, the playoffs were never in the cards for the Rattlers. During his senior year, RGC finally hit the that next level and earned a playoff berth. Nunez responded with two outstanding games, fighting to keep his team alive. For Nunez’s senior year on the court, and his efforts in the postseason, he is The Monitor’s 2018 All-Area Defensive Player of the Year. Nunez made several standout blocks in the playoffs. He even had a dunk or two that sent the crowd into a tizzy. But what really defined him as a defensive weapon was his rim protection. When opponents drove and tried to finish in the lane, Nunez was always there to alter the shot. He played almost every minute of most games for the Rattlers, and yet his defense rarely fell off. Nunez works just as hard on basketball during the offseason as he does during the season. In the summer, he works with the Vipers Jr. Academy. That was never more evident than when the Rattlers faced San Antonio Harlandale in the area round of the playoffs. Harlandale boasts a 6-foot-3 center, Bryce Carter. Carter is very athletic and quick, but his post moves are still raw. Nunez held Carter in check during the game, getting the better of the matchup. The Rattlers led for a decent amount of the night, but Harlandale pulled away in the end for the 62-50 win. Nunez is poised to play at the next level, but he’s not sure where yet. As he prepares for the next chapter, he looked back on what got him into basketball. Nunez said he started late. He didn’t even know he would play basketball as a child. Nunez and Richard played together through eighth grade. Entering Nunez’s ninth-grade year, he was already taller than 6-foot-3, so he was sent right to the varsity squad. Richard, meanwhile, stayed on the freshman team, and the two never got to play together for their school again. Still, Nunez shows immense gratitude toward the friend who pushed him into the game that changed his life forever.